There’s no shortage of advice on building a successful investing career. But the best advice comes from trusted sources – and King Solomon is one of the most trusted financial advisers you’ll find. 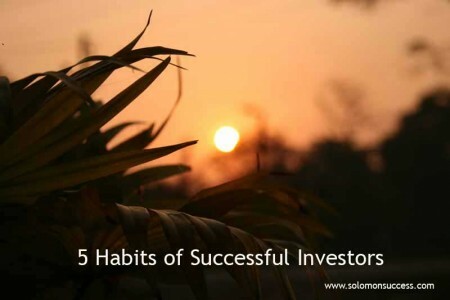 His timeless advice about wisdom and prudence stands behind the five habits shared by successful investors everywhere. “A wise man shall hear, and shall be wiser,” says King Solomon in Proverbs 1:5, “ and he that understand shall possess governments.” Smart investors are always looking for ways to educate themselves – about the process of investing, about their own investments, and any other areas related to their investing enterprise. That’s the first of Jason Hartman’s 10 Commandments for Investing Success. Too – the more you know, the more you realize what you don’t know – and you can take steps to fill the gap. “Lean not upon they own prudence,” King Solomon tells us in Proverbs 3:5. A key part of learning is recognizing when it’s time to tap the expertise of others. And getting good advice and information leads to prudent decisions. That’s where education comes in. If you’ve learned enough about real estate and investing in general, you’ll be better able to find an advisor who knows the business. All too often, scammers take on the role of advisor or broker. They’ll try to convince an unwary or lazy investor to let them take charge of the process – and the money. Then they’ll disappear, having done nothing they promised – or leaving you, the investor, holding a very empty bag. Successful investors know enough about the issue at hand to evaluate the advice they’re given and to check the credentials of those giving it. And whether the expert is a real estate broker or a roofing contractor, they’ll be informed enough to accept-or decline – that individual’s recommendations. Pay attention to wise counsel, says King Solomon in Proverbs 3:23, and “then shalt thou walk confidently in thy way.” Income property investors who practice the first two habits are well prepared for this one. A proactive investor maps out a plan for the future, and armed with knowledge and good advice, makes the decisions that move things forward. It might be easier to hand things over to a team of advisors or investment managers – but that also means that they’re making the investing decisions. It also means that they take action when things aren’t working – firing a bad property manager, or evicting a problem tenant, rather than waiting for the situation to solve itself. Proactive investing of the kind Jason Hartman recommends is the key to staying in control of the process all the way. Goal setting provides a focus for the day-to-day actions that drive investments toward success. Though circumstances might mean they need some tweaking, those goals, which taken together make up the long term plan, become the roadmap for making an investing career work. You might want to enlist the advice of a trusted advisor to help create a plan for the future – a bigger picture that lays out what you expect from your investments, and what you need to do to make that expectation a reality. Like that ant who toils on with an eye to the winter, smart investors know that get rich quick schemes are called schemes for a reason. Real estate investing is a process for the long term. While house flipping looks like a way to make fast money from the quick purchase and sale of a house, as Jason Hartman points out, it isn’t really investing. In income property investing, slow and steady wins the race. Holding on to a mortgaged property over time is the real estate gift that keeps on giving – and smart investors plan for making money that lasts – over time.